Thanks for tuning into the show on KAOS for the past two years! 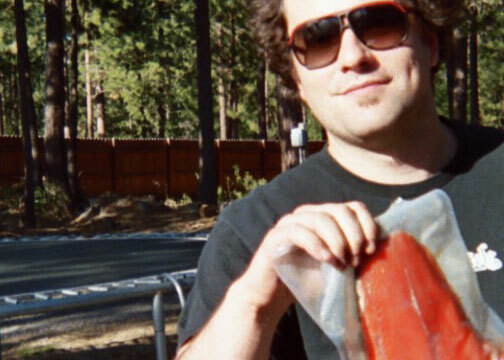 I graduated from Evergreen State College and now I’m in Boise for the summer, helping Boise Community Radio work toward an FM launch in 2009. I will post updates throughout the summer and fill-in as much of the past two years of archives as I can before launching a new 30-minute weekly show around October 1st. Please contact me over the summer if you have questions about past content on the program, or want more information about anything. Sunglasses! Grilled Wild Salmon! Camping! and Trampolines? Also there is big news from the team working on the Northwest Community Radio Network! A new regional weekly collaborative radio show has launched and you can listen for free online. Listen Up NW has already begun airing and is coming soon to more stations in Washington, Oregon, Idaho, British Columbia and Alaska. Mind Screen hosted a Valentine’s Seminar in the Critique Room [Sem II E4115]. Admission and popcorn were free, of course. KAOS DJ Luc was spinning. 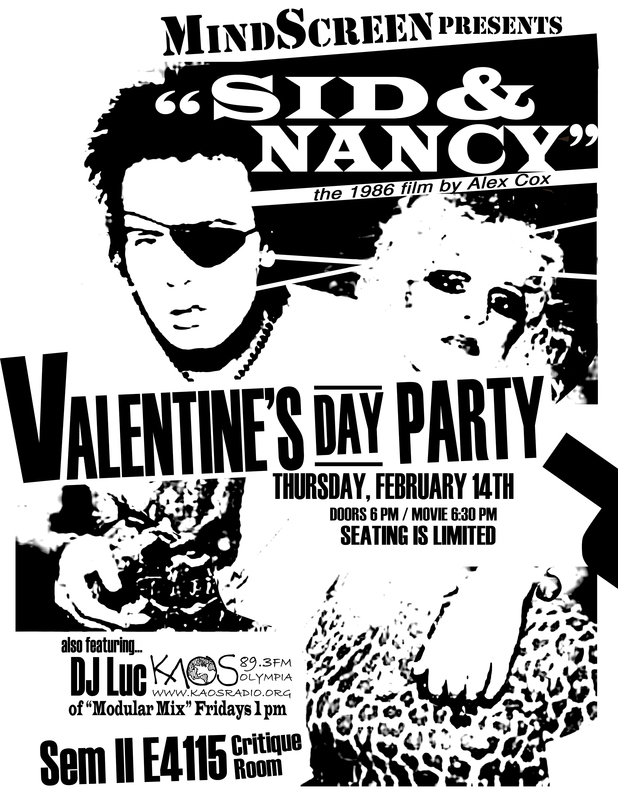 Sid & Nancy screened at 6:30pm. Mind Screen, the cinema-loving student organization that always shows free movies, and always programs interesting titles, based on input from fellow students. January 30th I testified in front of the Washington state legislature. The House committee on Technology, Energy and Communications was considering House Joint Memorial 4028, a bill introduced by Representatives Bob Hasegawa and Deb Wallace, condemning the Federal Communications Commission’s decision in December to expand newspaper-broadcast cross-ownership and the process that the FCC followed in delivering their decision. More than 1000 folks from around the northwest participated in the FCC’s final hearing on media ownership at Seattle’s Town Hall in November, demanding no further consolidation. A month later, the Republican FCC majority moved ahead, deregulating despite public outcry. Though it is a non-binding resolution, HJM 4028 asks the U.S. Congress to work in a nonpartisan manner to pass the Media Ownership Act. Only two members of the public signed up to speak on the rainy Wednesday afternoon. I represented the public interest perspective and Mark Allon, the head of Washington State Association of Broadcasters represented the industry perspective. (KAOS is a paid member of WSAB.) We were brought up together to the front of room, and we seated ourselves in front of microphones facing the committee. I was dressed sharp, with a sport coat, scarf, Merck Records hat and fresh sneaks. Mr. Allon was dressed conservatively, like the majority of suits on a given day at the Capitol. 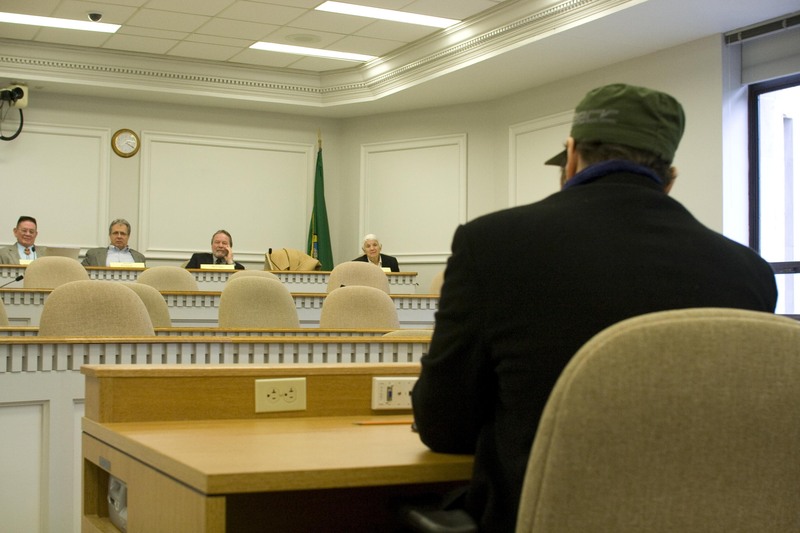 I’ve been to hearings at the Washington state capitol before, but this was my first time testifying. Mr. Allon invited me to speak first. I introduced myself, and identified KAOS radio and Olympia Film Society as two organizations that receive my volunteer efforts. I also asserted that I was speaking on behalf of the membership of Seattle-based nonprofit Reclaim the Media, then began with a preface. I knew that at least some members of the committee were following me at this point, and operated with the assumption I was connecting. I moved on. 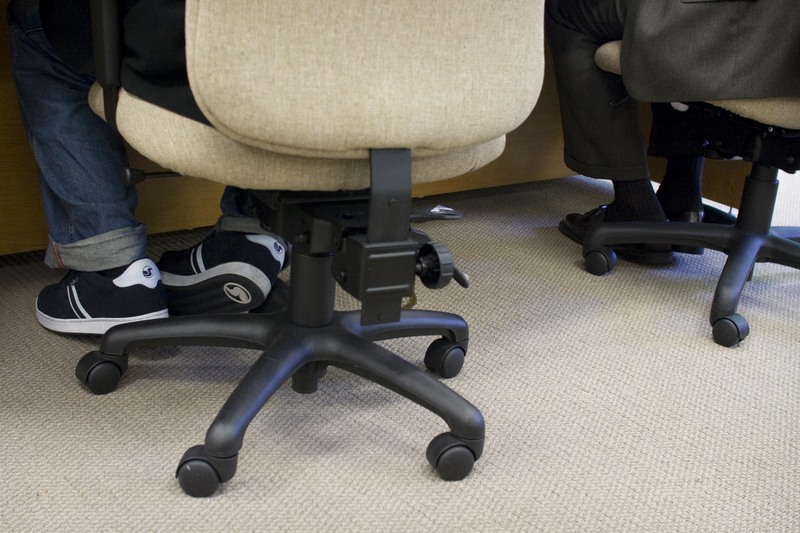 At the delivery of this punch line of sorts, a couple committee members seemed amused. I felt encouraged, and continued. The committee chairman interjected at this point, telling me that I need to watch my words, because we shouldn’t use the committee testimony to impugn. I assured him I understood, though under different circumstances I might have insisted that there is plenty of very public evidence to back up what I was saying. Nevertheless, I continued. A couple more nervous laughs emanated from the committee, but I was feeling shaken, and out of place. This brought a surprising outburst of laughter from the committee. I was going to say the FCC has been privately notifying favored lobbyists of rules and hearings, but it didn’t matter. I was beginning to sense the committee was already on board. So I hit them with the goods. “It is fundamental that Americans seize our opportunities to testify in front of the FCC commissioners, their staff, the media and the public, whenever we can get an opportunity. On November 9th I was one of more than 1000 members of the public who turned out to oppose further media consolidation. Democratic Governor Christine Gregoire and Republican Attorney General Rob McKenna as well as elected state and federal legislators from both parties including Representaive Hasegawa implored the FCC not to deregulate! I also pointed out that the Media Ownership Act passed the Senate Commerce Committee unanimously in December and then Democrat Jay Inslee and Republican Dave Reichert introduced the bill in the House in December as well. At the end of my testimony the chairman thanked me, saying it was very good. Ironically, despite making a very strong case, Mr. Allon referred to one of the studies recently commissioned by FCC chairman Kevin Martin. I had already primed the committee to reject it. I felt like Mr. Allon was not expecting to have an articulate college student speaking against him, and when he finished, he left. After a brief recess, the committee returned and voted unanimously to support HJM 4028 and the passing of the Media Ownership Act by Congress.